Book Announcement and Sneak Peak! 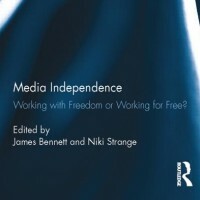 Media Independence Working with Freedom or Working for Free? 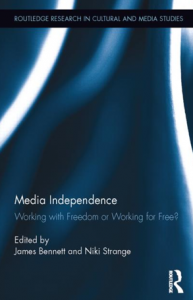 What do we mean by ‘independent media’ or the ‘independence of media’? This book brings together leading scholars in media, cultural studies, digital media, television and film to cast a critical eye over the term and its importance to media systems around the globe. In so doing they set out a new critical paradigm for studying independent media and the independence of media, raising key questions about economics, production cultures and ethics, aesthetics and the formation of media platforms. We were lucky enough to work with some amazing scholars in this collection who each turn over the notion of independence in different ways and in different contexts. The result is, we hope, a cutting edge collection of research into media power. Routledge was kind enough to let us post the Introduction here on Culture Digitally as a sneak peak. The book is available from Routledge here. 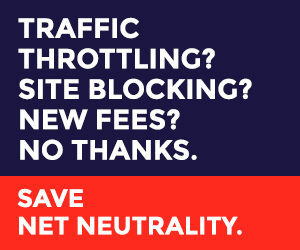 We hope you will enjoy reading it and look forward to hearing your thoughts.